Mice are allowed to freely explore the arena. Distance, activity, time spent in the center vs edge are measured using video-tracking system. Rearing behavior and grooming activity can also be scored manually. 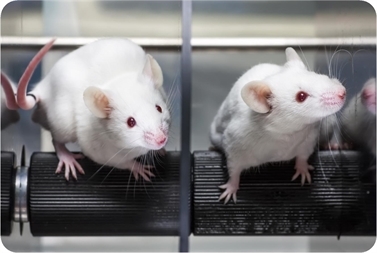 Long time recording (30 min - 1 hour) is generally used to evaluate general activity of mice. Motor function and coordination can be evaluate with the rotarod test. Mice are challanged to walk on a rotating rod that increases in speed over a predetermined period of time (in general, for 5 min) until the animal fall. The latency to fall from the rod is determined and taken as a measure of motor function. The daily trial consists of three measures spaced by 5 minutes.